This year’s string of brutal hate crimes is intrinsically connected to the rise of Trump. 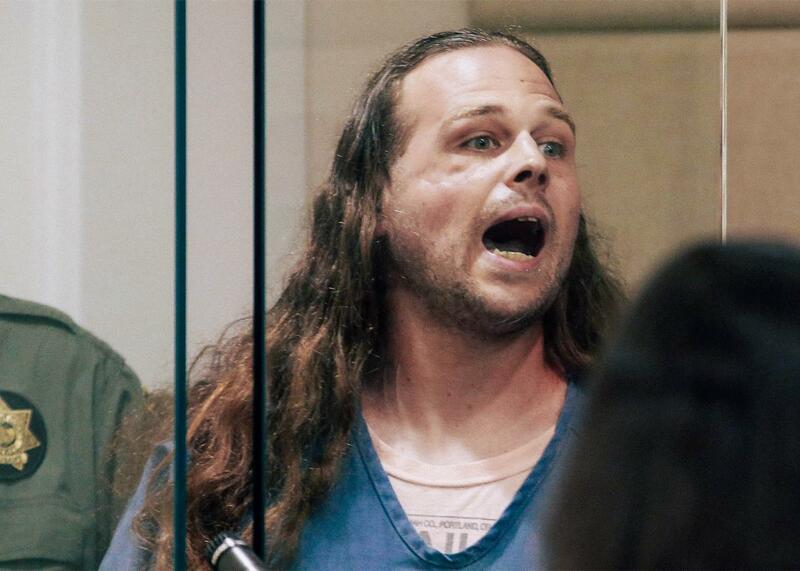 Jeremy Christian, accused of stabbing three men, shouts during an appearance in Multnomah County Circuit Court in Portland, Oregon, on May 30. Last week, in Portland, Oregon, a man with a history of white supremacist rhetoric allegedly killed two men and injured one other who had tried to stop his harassment of two young women—one black, the other wearing a hijab. A week earlier, in College Park, Maryland, another young man—active in white supremacist Facebook groups—killed a black college student after confronting him on the street, according to police. In March, a white supremacist reportedly traveled from Baltimore to New York City with the express purpose of killing a black man, which he did, before turning himself into police. Earlier that month, a Sikh man was shot and injured in front of his house in a Seattle suburb. His alleged attacker reportedly shouted “go back to your country.” Days earlier, in Kansas, authorities described how a man walked into a bar and shot three men, including two immigrants from India, after shouting “get out of my country” and yelling racial slurs. One of the Indian men, Srinivas Kuchibhotla, died of his wounds. More recently, a California man was alleged to have stabbed a black man with a machete after yelling racial slurs—he’s facing charges—and a Native American man was run down and killed by an assailant who allegedly shouted racial slurs. Nationally, white supremacist and white nationalist activity is on the rise, from more aggressive recruiting online, to active organizing and intimidation on college campuses. Law enforcement officials in cities such as New York have seen a surge in reported hate crimes, and the Southern Poverty Law Center reports an increase in the number of hate groups. All of this takes place against a backdrop of political intolerance. Donald Trump ran for president on a platform of ethno-nationalism, offering interested white voters a chance to express and vote their resentments against Hispanic immigrants, Muslim Americans, and groups like Black Lives Matter. His campaign brought explicitly racist groups, individuals, and institutions into the mainstream, from Steve Bannon—who rode the success of his hate-fueled site Breitbart to a position as a top adviser in the Trump White House—to formerly fringe figures like Iowa Rep. Steve King, who routinely traffics in white nationalist rhetoric. Millions of white Americans stomped the floor for Trump’s promise to end “political correctness” and restore prosperity through tough action against foreign others, turning out at higher numbers than either 2008 or 2012. This rhetoric has a real impact. A recent working paper suggests that when people view Trump’s popularity as going up, it “increases their willingness to publicly express xenophobic views.” It’s a straightforward idea: High electoral support for a candidate who espouses prejudiced views may shape how individuals perceive the social desirability of those views. In our case, the election of Trump may have weakened norms against the expression of various bigotries, including racism. To all of this, add the return of “scientific racism” to public view and the recent controversies over Confederate memorials and Confederate remembrance, which have galvanized a broad stripe of racial reactionaries. Throughout American history, the ascendance of political racism—the use of explicit prejudice to energize voters and win elections, often as a backlash to the social and economic advancement of black Americans and other nonwhite groups—has brought corresponding waves of racial violence. The “white supremacy” campaign that struck North Carolina in the state’s 1898 elections combined heated, racist rhetoric with a campaign of terror against black Republican voters and their white allies. Likewise, during the heyday of the civil rights movement, the heated demagoguery of segregationists was fuel for the violent responses that marked the crusade for black rights. From here, events snowballed. Rowland was arrested and taken to the Tulsa County Courthouse, where local whites were gathering. Fearing a lynching, blacks in the prosperous Greenwood neighborhood—including veterans of World War I—armed themselves and went to the courthouse, determined to support the sheriff and defend Rowland. Seeing armed blacks, this group of whites gathered their own guns, even attempting to raid the local National Guard armory. As tensions built between the thousands of armed whites and the smaller group of armed blacks, a gunshot went off. What followed was a shootout between both groups, leaving 10 whites and two blacks dead or dying. Gunfights continued throughout the night and into the next day, reaching Greenwood, as armed whites attacked bystanders and set fire to homes. By the morning of June 1, whites were using biplanes to drop incendiary bombs over the neighborhood. The mob destroyed Greenwood, burning it and its wealth to the ground. Thousands of families fled, and the best estimates suggest a death toll of at least 100. This history doesn’t just matter as an event in its own right; it matters because of its context. The racist anger of the white citizens of Tulsa, their zeal for vigilante violence, was part of a larger mood of nativism, anti-Semitism, and racism in the United States. Leading figures like Henry Ford stoked hatred of Jews through the Dearborn Independent, a weekly newspaper with a circulation in the hundreds of thousands. Groups like the Ku Klux Klan claimed millions of members, including influential lawmakers in states and localities across the country. Woodrow Wilson, who resegregated the federal government and turned a blind eye to lynching, had just left office. He was succeeded by Warren Harding, who embraced the “Anglo-Saxon” chauvinism that consumed American intellectual life at the time. And countless Americans were still flocking to theaters to catch Birth of a Nation, with its starkly racist imagery and celebration of anti-black vigilantism. Adding fuel to this fire were the winds of backlash. Tens of thousands of black Americans had served in World War I, and they returned home with a new sense of dignity and worth. They believed that their service entitled them to the fruits of American democracy, to equal rights, equal participation, and equal opportunities. They were entitled to that, of course. But the truth of that threatened racial hierarchies and white dominance. What followed the end of the war was a nationwide storm of violence against black communities, as white anxiety mixed with racist ideology to produce a wave of racial repression. Key to all of this is the interplay between racism in culture, in politics, and in public life. Each reinforced the other, creating an atmosphere of hostility and violence that wasn’t otherwise inevitable, even as it had its antecedents. Put differently, racist violence isn’t spontaneous; it creeps up from fertile ground, feeding on hate and intolerance in the public sphere. The lynching epidemic exploded with the end of Reconstruction and the reconciliation of Northern and Southern whites under the banner of white supremacy, pogroms in towns like Tulsa occurred in an atmosphere of unimaginably virulent racism, and the killings and assassinations of the civil rights era were inseparable from the segregationist fire-eaters that governed states like Mississippi and Alabama. Today, the rising pace of hate crimes is tied to a political style that has harnessed and weaponized white resentment by way of an ethno-nationalist movement that sees America in narrow, racially exclusionary terms. This is why social and political sanctions against racism have historically been so important. This is why we tolerate the public expression of racism at our own peril. Embedded in racism is an eliminationist impulse that grows out of the explicit call for exclusion. In the right environment, under the right conditions, the call to remove “others” can become a drive to destroy them. We are living in an age of political racism and mainstreamed hate, where white supremacists act and organize in the open, so we are now also living in those conditions. Through our political choices, we have unleashed one of our deadliest legacies. We can already count the victims.